Here’s your Wednesday morning briefing. Good morning, here’s your breakfast briefing for Wednesday, November 7. Monday’s Brekkie Bites revealed the lineup of the mighty Team Australia. I also did some light analysis of the squad, which focused on the return of Australia’s spiritual leader and three-time ISA gold medalist, Shakira Westdorp, to the race board. I had a quick chat with Shak on Facebook to get her thoughts on the new role, which mirrors her heavy workload in Nicaragua (2014) where she medaled in all three disciplines: bronze in the surfing, silver in the marathon and gold in the beach race. That extraordinary performance helped keep Australia’s unbeaten streak alive, and Shak will need to dig deep again as the Aussies face strong competition from the Frenchies and Americans. Take a look at the full story: Shak says “I’m pumped!” for China. The ISA Worlds start in China later this month (November 23 – December 2). 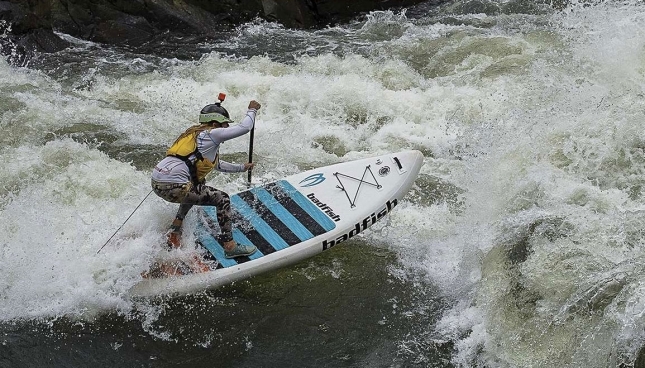 Brittany Parker (no relation, unfortunately) has penned a great article about the first SUP descent of Africa’s infamous Zambezi River, a mighty stretch of water that contains many class 5 rapids. The odyssey actually happened over a year ago, but SUP the Mag only just posted the digital version. It’s a fascinating read about one of the most under-rated aspects of our sport–whitewater river paddling.